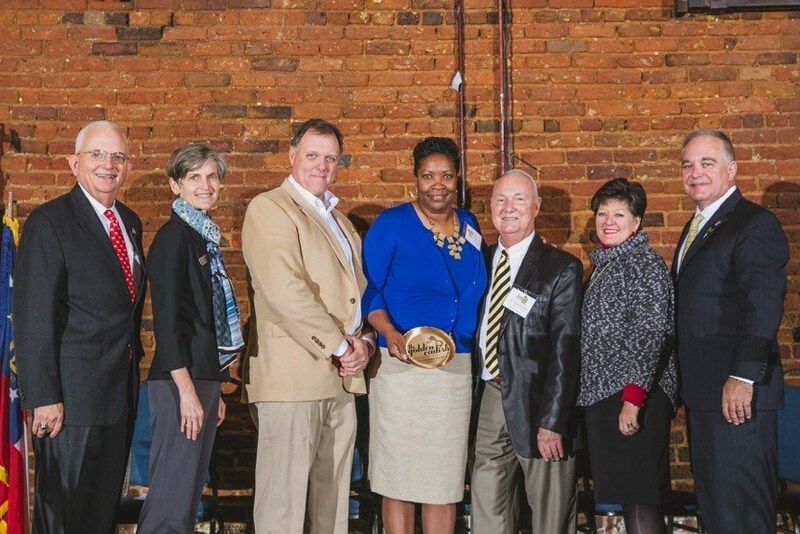 Tift County Schools was given the “Outstanding District” Golden Radish Award, the highest level of recognition in the state for farm to school programs. Tift County School System includes farm to school in their Wellness Plan and the Board of Education’s Strategic Plan for Improvement. The School Nutrition Department’s mission is to expose, educate, and elevate the quality of meals served to 7,600 students in the district’s 12 schools. They have created one of the state’s most robust and innovative programs focused on agricultural and nutrition education, supporting local farmers and getting students excited to eat delicious, healthy, fresh, local foods. Georgia’s Departments of Agriculture, Education and Public Health, University of Georgia Cooperative Extension and Georgia Organics came together at the historic Georgia Railroad Freight Depot to celebrate over 40 percent of Georgia school districts with excellent farm to school programs. Seventy-five school districts, serving more than one million students in Georgia, are now participating in farm to school. These districts served more than 97 million school meals with local food items during the 2016-17 school year. • The School Nutrition Department purchased a cow from a student and had it processed by a local community partner. The meat provided meals for four days to over 300 students at Omega Elementary School. • The district supports a 15-acre farm where students learn how to plant, maintain, and glean crops on a larger scale. Students also learn how to extend the life of their harvest at the county’s state of the art canning facility maintained by an FFA instructor. • Local farmer Len Lastinger taught students how to harvest eggs from the schools laying hens. The corresponding omelet taste test was a big hit! ● Involved parents and community members in 1,339 farm to school activities. 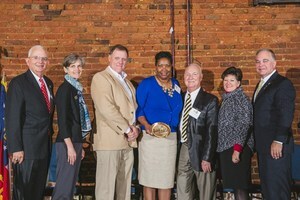 Pictured are Georgia Commissioner of Agriculture Gary Black, Georgia Organics Executive Director Alice Rolls, Superintendent of Tift County Schools Patrick Atwater, School Nutrition Director of Tift County Schools Vanessa Hayes, Georgia Department of Health Commissioner Dr. J. Patrick O’Neal, UGA Associate Dean for Extension Dr. Laura Perry Johnson and Georgia State Superintendent of Schools Richard Woods.